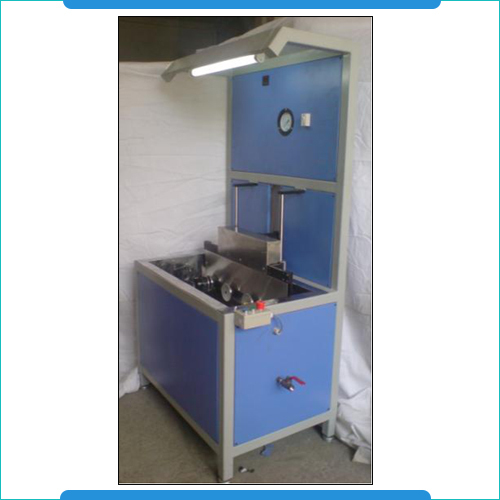 Leak Testing machines are the automatic leak test/pressure test equipment that allow efficient handling of pressure testing or vacuum testing operations. Here, we can deliver these in customer specified acceptable leakage rates/leak limits so that they can reliably check how much item is leaking. The machines are made available with four filter clamping stations with option of changing threading adapter as per the requirements. These machines are available with pneumatic cylinder operations for raising as well as lowering of the manifold. Some of the other standard specifications of the equipment include filter opening provision through clockwise and anticlockwise provision, SS fabricated water tank, pressure gauge for display of pressure and pneumatic cylinders and valves Festo/SMC make. Nos. of filter clamping station 4nos. Facility to change threading adapter as per requirement. Pneumatic cylinder operation for raising and lowering the manifold. Opening of filter by rotating clockwise and anticlockwise. Pressure gauge for display of pressure. All pneumatic cylinders and valves Festo/SMC make. 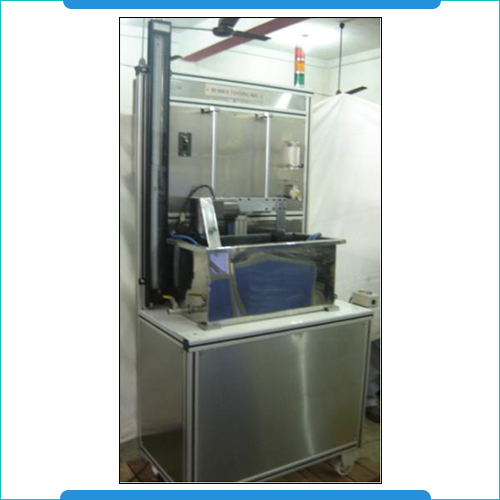 Bubble Testing Machines can check assembly for bubble test leakage. It provide accurate measurement of bubble point of the material without being put underwater. These machines are applicable in industries like Biotechnology & Healthcare, Automotive, Food & Beverage, Filtration, Ceramic and Pharmaceuticals. The machines feature aluminum extruded section frame and come in maximum filter diameter of 150mm, maximum filter height of 250mm. Further, the system also comes with filter element clamping arrangement, support for rotating filter by motor to see first bubble formation, digital flow meter as well as pneumatic arrangement to lowering and raising the element clamping fixture into tank. Maximum dia. of the filter 150mm. Maximum height of the filter 250mm. Polycarbonate tank dipping filter into test oil. Arrangement to rotate the filter by motor to see first bubble formation. Pneumatic arrangement to lower & raise the element clamping fixture into tank.